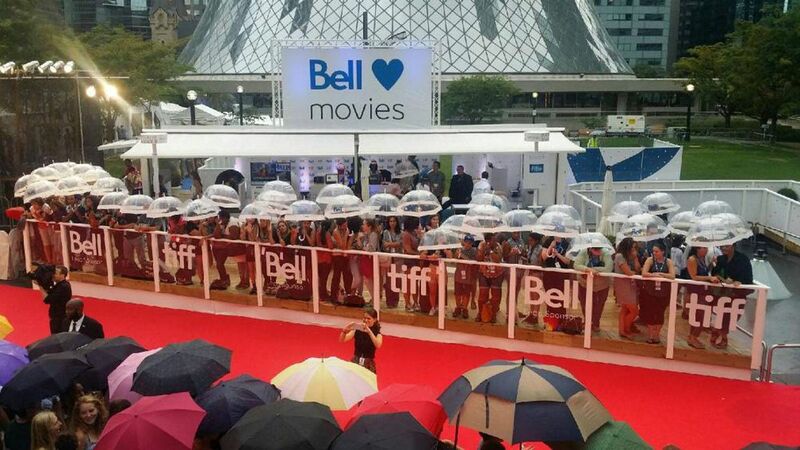 Bell Canada’s sponsorship of the Toronto International Film Festival includes sidewalk attractions, such as a temporary four-storey pavilion for gawking at the stars entering gala screenings, and an outdoor movie screening lounge. For Bell Canada, having its name on the Lightbox, which becomes the heart of the Toronto International Film Festival every September, is more than a gesture of traditional brick-and-mortar (or glass-and-steel) philanthropy. From Bell's perspective, its relationship with TIFF is a very different approach from traditional naming-rights arrangements. "We would never look at a facility or naming-rights deal simply to put a name on a door," says Loring Phinney, Bell's corporate marketing vice-president. "That doesn't create enough impact or value for a customer. That's bricks and mortar. It's what is inside that ultimately matters." With TIFF Bell Lightbox, which also showcases world cinema, independent film and screen-arts programming throughout the year, the telecommunications company is clear that having its name outside the Lightbox is mostly about marketing. Any sponsorship of a cultural institution or sports complex provides a touchstone for the benefactor in the city. Yet the focus on marketing is more than simply nurturing what happens inside the building. It's about ensuring that TIFF radiates out into the city, if not the world. The Lightbox partnership between Bell and TIFF is up for renewal next year, and by all indications, it looks like it will continue. "It is both of our intentions to renew this deal," says Mr. Phinney. For Bell, it's a situation similar to 2005 when Bell and TIFF announced the $30-million deal which gave Bell naming rights for the building. It opened five years later on King Street West with TIFF esconced on the first five floors of the 46-storey condo tower. "We were in a renewal year anyway," Bell Canada's senior vice-president of corporate marketing Jim Little had said at the time of the original deal, adding that "we were looking for a significant Toronto property to step up to." So what criteria was Bell looking for then, and what is it looking for now with the Lightbox? For TIFF, the partnership was, and continues to be, an obvious financial boost. Raising the money for the Lightbox wasn't easy. "It's a hard slog out there," TIFF co-director Piers Handling said during the fundraising process. Mr. Phinney, who at that time had recently joined Bell prior to the Lightbox deal, characterized the discussions as mutual courting. It wasn't so much a high-stakes competition as one might expect, given that naming rights to major cultural and entertainment centre such as the Lightbox don't become available every day. "I think we had seen the success that TIFF was becoming on a global scale. The festival was definitely on a growth trajectory. People were speaking about it internationally," Mr. Phinney said. But he explained that the Lightbox building is only a component of Bell's partnership strategy with TIFF. "Really it's the overall relationship, where we can wrap it up and say, 'We think we can enhance the experience of the customer. We think our financial support can help the festival grow and be better.' And, boy, has it ever done that," he said. And here's where marketing differs from traditional philanthropy. "We rarely look at naming-rights partnerships. When we do, they have to have something where we can engage a passionate fan base, where there's a large group of people who really care about it, who really appreciate the support," Mr. Phinney said. From there, the idea is to continue to fund activity enhancing the experience. Part of that is to appeal to art-house cinephiles, who appreciate that so much of what Lightbox shows is so rare to find on a big screen, outside of other film institutions and museums. But on the more populist side, Bell also sponsors sidewalk attractions tied to the festival, such as a temporary four-storey pavilion for gawking at the stars entering gala screenings, and an outdoor movie screening lounge. For Mr. Phinney, this means maintaining close personal ties with TIFF organizers to continue dreaming up new installations and public attractions. It's not a formal, hands-off relationship, Mr. Phinney indicated. "You can imagine, we get dozens of calls a year to do naming-rights deals. People see value in a brand like Bell or one of the banks, or our competitors, being on the facility. To me, it's more about finding the right fit, than to have a competitive process," Mr. Phinney said. With two of its sponsorships – the Bell MTS Place, which is the home arena of the Winnipeg Jets, and Studio Bell, which houses the National Music Centre in Calgary – Bell was the only company talking about naming rights with the other parties. And Bell used the Lightbox as a model when it signed on to sponsor Studio Bell. Instead of highlighting film, Studio Bell highlights music. "We have some proprietary research techniques to demonstrate the relevance of our properties. But ultimately, you can tell that in the case of TIFF that if it's on a growth trajectory, if it's doing well, if it has great numbers of people [visitors], if the ratings of people are high, then we're confident this is a great property," Mr. Phinney said. Perhaps another surprising aspect inside a deal such as TIFF Bell Lightbox is that, at Bell, "we don't have traditional measures in our contract that determine whether we're going to do this. But we do have great insights on whether the products work for us, whether our hosting is successful," he said. Ultimately, what the marketing strategy acknowledges is that someone visiting TIFF Bell Lightbox isn't going because Bell has its name outside. The argument is that the visitor is going on the expectation of being enlightened or entertained. Bell has to help TIFF match that expectation, so the reasoning goes. "There's that soft undertone, which is that our financial support, our partnership support, is enabling these things in our cities to happen. And that's great, but we really don't want to stop there. We want to enhance it even further," Mr. Phinney said. "Every hospital, every charitable institution, has a name on it. There are lots of naming-rights deals in the philanthropic space. This isn't that. This is the marketing space."